On Tuesday November 7th 2017, 3DlexiaCosmos non-profit organization that highlights the importance of Holistic, Transformative Education for Peace and Sustainability in the 21st century and Biopolitics International Organisation, non-profit NGO with the mission to promote international environmental cooperation and education, co-organised event with the support of the Cyprus Ministry of Education and Culture in the Palais de Nations, the European headquarters of the United Nations, during Geneva Peace Week 2017. The event under the theme ‘Pursuing Global Citizenship through Education for Peace’ highlighted the importance of bonds and synergies in peace education by encouraging cooperation between different stakeholders. Educators and policy makers shared crucial insights on global citizenship education for peace-building internationally. 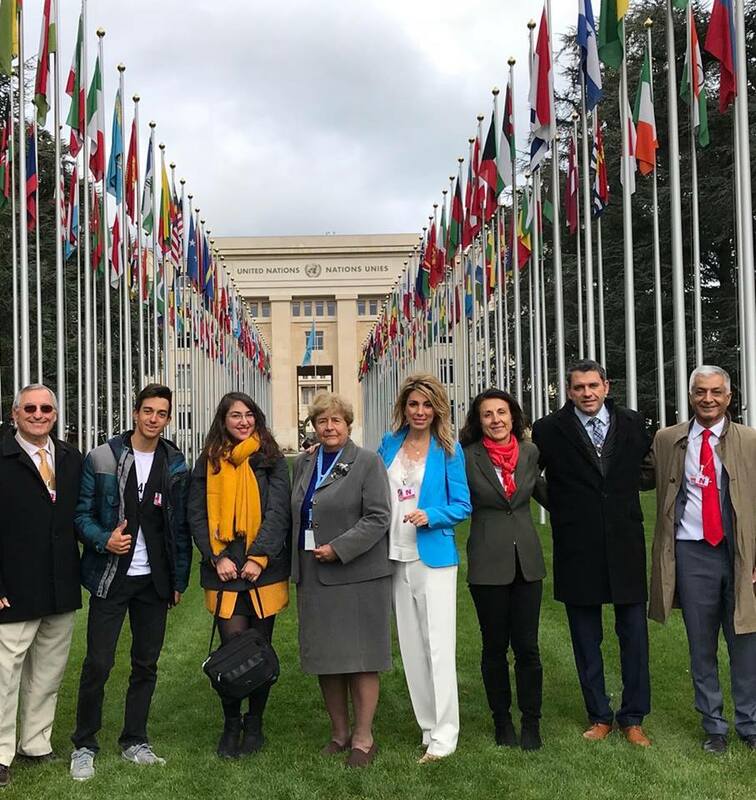 The event was the only one during Geneva Peace Week 2017 that focused on conflict prevention through holistic education which cultivates skills to become global citizens and was attended by numerous international delegates and civil society agents. The event was chaired by Prof. Agni Vlavianos Arvanitis, the President and Founder of Biopolitics International Organisation and 15 times nominated for the Nobel Peace Prize. In her speech, she emphasized the role of quality education as a powerful tool in transforming communities for global sustainability and prosperity. Among the distinguished speakers Ms. Aggeliki Pappa, the President of 3dDlexiaCosmos, CEO of ‘i love dyslexia’ EFL School and for two consecutive years among the top 50 educators worldwide for the Global Teacher Prize, presented officially her own holistic educational methodology ‘3Dlexia Paradigm’ for K-12, based on insights through innovative research on the neuro-quantum subatomic level of the brain and a combination of science, technology and art, aiming to spread worldwide her vision and philosophy for Transformative Pedagogy for Peace, Love and Sustainability for the 21st century; Mr. Marios Epaminondas, Representative of the Cyprus Ministry of Education and Culture transferred the message of Mr. Costas Kadis, Minister of Education and Culture of Cyprus: ‘We know that education cannot be anything else than education for peace and we need to turn this concept into a practice’ and shared Cyprus experience referring to synergies with Civil Society Associations and International Organizations that contribute to the development of active citizens with a global perspective; Mr. Stefanos Gialamas, the President of the American Community Schools of Athens presented a new educational paradigm based on Comprehensive Learning Experience that prepares young people to become tomorrow’s citizens with Ethos to make the world a better place; Mr. Ali Rashidi, Director of the Department for International Cooperation, Folkuniversitetet-Uppsala focused on Education in Human Rights for achieving the goal of Global Citizenship through an innovative game developed to promote peace; Ms. Helen Poulla, EFL State School Advisor for the Regional Directorate of Primary and Secondary Education in Crete presented ‘Educating for Peace’, a programme implemented in state schools in Crete with Aggeliki Pappa’s and ‘i love dyslexia’ active contribution, aiming to support EFL state school teachers to develop inclusive curricula helping students to become active citizens; Vasilis Boumbis, 16 years old student of ‘i love dyslexia’, the only student with his own speech during Geneva Peace Week 2017, presented SOS4Love Project that stands for ‘Students Organise Solutions’ to change the world with Love, inviting students and educators from all over the world to connect and collaborate on this initiative, that emphasizes the power of youth in society. 3DlexiaCosmos is a non-profit organization based in Athens, Greece with the vision to elevate Humanistic, Holistic Education for sustainable development as the principal mean of leverage for the existing general national and international crisis we are experiencing. 3DlexiaCosmos actions address to students, educators and citizens of Greece and the international community aiming to awaken, internally empower, encourage, and cultivate in-depth the human virtues, spirit, knowledge and innovative thinking so they may hope to attain their personal fulfillment, thus actively contributing to the sustainable development, as useful, able, balanced and conscientious citizens of the World. This can be achieved through the implementation of innovative educational paradigms like 3Dlexia in order to achieve transformative results in the future of the world with the power of holistic education.